The fising season in Iceland started on April 1st. “Our” rivers as Húseyjarkvísl, Litlá, etc. did very well as in the past years. 24 fish were caught on the Húseyjarkvísl on the first day of fishing with 3 rods, on Litlá more than 90 fish were caught with 5 rods. Brown trout and sea-run brown trout reached lengths up to more than 70cm. Regarding trout fishing everything looks very promising this year. The rivers in our portfolio are booked heavily, but here and there some rods are still free. info@pukka-destinations for details. Besides trout fishing there’s for sure salmon fishing on Iceland as well, which is one of the best and most desired ones in the world of flyfishing. With our contacts we are able to get access to most of the Icelandic salmon waters, as well in prime-time. This post will cover three of those salmon rivers which can highly be recommended: the Vatnsdalsá, Haukadalsá and the Húseyjarkvísl. We can offer rods on Vatnsdalsá due to cancellations in one of the most desired weeks, from August 8th to August 15th. 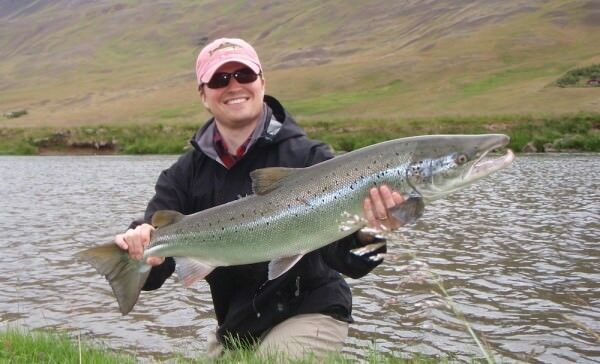 This is 7 days of prime-salmon fishing including fullboard accomodation in a first-class lodge, guiding by the best Icelandic salmon guides, transfers and pick-ups in Iceland. This week normally is not available because it is steadily booked years in advance. You have the option to share rods as well as book time slots of 3 to 7 of duration. The 5-year-average of this week is 61 fish averaging 4 kilograms in weight. More Information through contact; finally one nice picture of a huge salmon from Vatnsdalsá.